Meet Babsy the talking baby in her bedroom. Talk with her and she will repeat everything you say and respond to your touch. 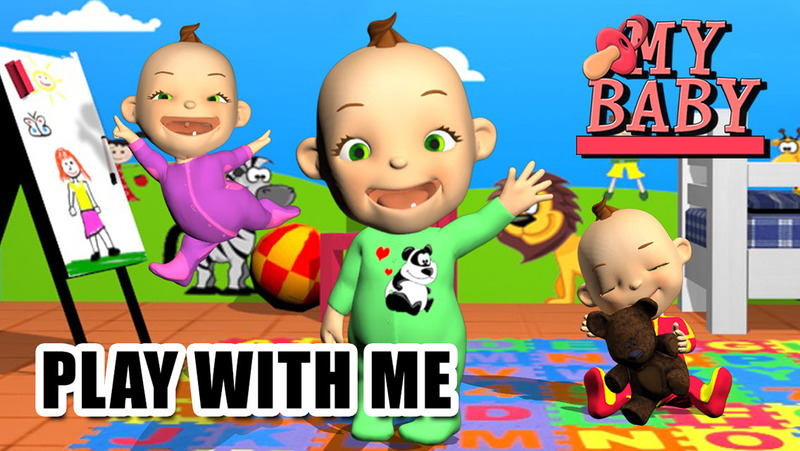 Spend a great time with Babsy and her activities. Have a look at Babsy playing the guitar or the maraca. Enjoy dressing her up with the pajamas you like the most and give her some fruit to eat or something else. Give Babsy her pacifier, or make her play with the teddy bear to comfort her when she feels a little bit sad. This application contains also 2 exciting games and a drawing option. Advise: Babsy is a little kid and as all of them, she will not always like what you would like to make her wear or eat but do not worry she will change her humor back to happy easily. - Many different animations like sneezing, smiling, laughing, dancing, sends kisses, etc. - Kids paint: Super entertaining tool to try and draw a picture with your fingertip. Discover the artist in you! Knockdown the cans: It is a simple but highly addictive game. Aim at pile of cans and throw them down with the provided balls. Strike down the exploding cans to destroy the entire pile with one hit. The green can provides you with one additional ball. Use as less throws as you can to establish a new record. Hit the Target: In this game you will simply have to be as precise as possible to try and hit the center of the different targets with the colorful Velcro balls. Simply aim carefully at the target, calibrate your strength and shoot.